From March 11 to March 15, 2001, the greatest Test match ever to be played took place at Eden Gardens, where India beat Australia. The victory heralded a new beginning for Indian cricket, built on the back of self-belief, determination, and honour that had gone missing after the match-fixing scandal. here were you in the March of 2001? Do you remember falling out of love with cricket, distrusting your heroes, wondering what you could trust if you couldn’t trust the gentleman’s game? If you listened real close, you could hear the game of cricket shedding tears. In April 2000, the Delhi police tapped the phones of a few notorious gangsters. What they didn’t expect to hear was the voice of South African captain Hansie Cronje. When the house of cards came tumbling down, it also took with it Mohammad Azharuddin, the nonchalant Indian skipper who could bring you down to your knees just by flicking his wrists and playing the most silken cricketing strokes. Yes, he left his wife for a B-grade starlet, all under the public glare, but nobody thought he could have cheated the sport that gave him everything! As hard as it was to digest, the answer was yes. A national-pastime-turned-national-passion had turned into national shame. We turned away from cricket, wondering when we could ever trust the game again. If it took one Hyderabadi in Azharuddin to hurt cricket, it took another Hyderabadi in Very Very Special Laxman to heal it. In March 2001, I was giving my board exams. The invincible Aussies, led by Steve Waugh, docked themselves in India, resolving to conquer the final frontier. It was a battle between the present and the future. If only I had known at that time the transient nature of trigonometry, biology, and the periodic table in my life, and the ephemeral joy and comfort that cricket would provide, life would have been infinitely simpler. The first Test match in Mumbai was done and dusted in three days. There were whimpers of a fight from Sachin Tendulkar and Laxman but the steamrolling was merciless. In the hot summer, silent classrooms were punctuated by the sound of papers and the humdrum sound of fans whirring. The second Test was in Eden Gardens; it seemed like a match lost on Day 3 itself. The Indian side collapsed and were 274 runs behind. Steve Waugh enforced a follow-on, expecting a historic series win to an innings away. On Day 4, Laxman surpassed Sunil Gavaskar’s record and became the highest scorer in Test cricket. We were all ready for the last rites. Back home, I would run to the school canteen that had a 14-inch television to catch bits and pieces of the action. Every time I went, I expected the end to be nearer. Instead, VVS Laxman and Rahul Dravid over the course of a day, turned a Test match and self-belief over its head. Can you hear the Kolkata crowd roaring? Can you hear Tony Grieg’s over-excited commentary? Can you see VVS Laxman coming down the track on the leg side and smash Shane Warne on the offside? The audacity of it all! Can you see VVS Laxman and Rahul Dravid? They, who batted till their backs had to be put back in place by a physio. Who batted and returned to a dressing room that had been installed with drips. Who batted with strips of towel dipped in ice water to keep them from collapsing out of fatigue. Run by run, sweat by sweat, the deficit was culled. A day that began as the beginning of the end, ended as a new beginning. In the span of five days, a nation’s faith in cricket was restored and the belief in our players regained. On Day 4, Laxman surpassed Sunil Gavaskar’s record and became the highest scorer in Test cricket. Rahul Dravid, who always put team above himself and came into the Test match on the back of patchy form, dug into his seemingly endless reserves and struck a resolute 180, a masterpiece that was overshadowed by Laxman’s Haley’s-Comet-like innings. From a deficit of 274, Australia were set a target of 384. Victory was beyond their reach. Given the calibre of the Australian batting line-up – Michael Slater, the Waugh brothers, Adam Gilchrist, Ricky Ponting, and Matthew Hayden – a draw was on the cards. Unexpectedly, Harbhajan Singh dismissed Waugh and Ponting in quick succession. Out of nowhere, Indian cricket’s folk hero, Tendulkar, emerged from the shadows. He accounted for the important scalps of Gilchrist, Hayden, and Warne. Harbhajan returned for a final bow and took the final wicket of Glenn Mcgrath. From the vice-grip of defeat, India came back from the dead to secure one of the greatest Test victories of all time. The Eden Gardens exploded. The Eden Gardens is the place of Indian cricket’s greatest dreams and nightmares. In 1996, the crowd ranted and raged, and set fire to the seats as the Indian side crashed and burned against Sri Lanka in the semi-finals of the World Cup. Five years later, they were exploding. This time it was a joyous outpouring of emotion. In the span of five days, a nation’s faith in cricket was restored and the belief in our players regained. It isn’t for nothing that Kolkata 2001 is rated among the greatest Test matches ever played, with Laxman’s masterpiece innings its crown jewel. Dravid’s 180, Harbhajan’s 13-wicket melee, and Tendulkar’s belated outburst, all seemed to find each other and come together for a magnum opus. What if India had lost in Kolkata? Would Sourav Ganguly have remained captain for long? Would they have gone onto win at Chennai and seal the series? The victory heralded a new beginning for Indian cricket, built on the back of self-belief, determination, and honour that had gone missing after the match-fixing scandal. It was built on the backs of Sourav Ganguly, Rahul Dravid, Anil Kumble, Javagal Srinath, Sachin Tendulkar, and later, Virender Sehwag, Zaheer Khan, Harbhajan Singh, and Yuvraj Singh. They secured historic victories, from Rawalpindi to Adelaide to Johannesburg, creating a new legion of fans and believers. Today, we’re on top of the world; the richest board, multi-million dollar contracts, the IPL. The dark days of the match-fixing scandal seem to be light years away. Current captain Virat Kohli has taken Dada’s aggression, which was the catalyst of change back in 2001, to the next level. In fact, the team seems stronger in every department today, be it batting, bowling, or fielding. We have record holders like Rohit Sharma opening the innings and wily veterans like Ashwin anchoring our bowling attack. On paper, one would be tempted to bet on today’s incarnation of Team India over the 2001 squad. That would be making the same mistake Steve Waugh’s Aussie side made back then, because in 2001, Team India had a secret weapon. VVS Laxman is the son of doctor parents. He had given himself a few years to make it big in cricket. If he didn’t, he had decided to go back to studying to be a doctor and follow in his parents’ footsteps. In a sense, he fulfilled his dream. He didn’t do it with a scalpel. He did it with a bat. 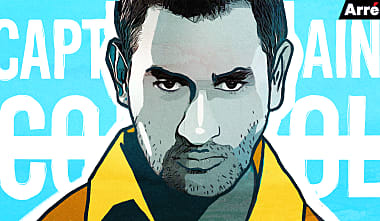 He played the innings that healed Indian cricket.